When it comes to pasta, the Hart & Soul team totally agree with the Italians “Life is a combination of magic and pasta” We know a lot of people out there don’t eat pasta as they think of carbs being the enemy. Pasta is actually the perfect foundation for a healthy, delicious and satisfying meal. As an ideal “delivery system” for other nutritious foods, pasta meals can easily become nutritional all-stars. Off course be sure to keep an eye on portion sizes (a one-cup serving of cooked pasta is roughly the size of your fist). Pasta is also an ideal partner for other nutritious foods that are essential to a healthy diet. It’s great to pair with fiber-filled vegetables and beans, heart healthy fish and oils, antioxidant-rich tomato sauce and protein-packed, poultry and lean meats. So many possibilities! 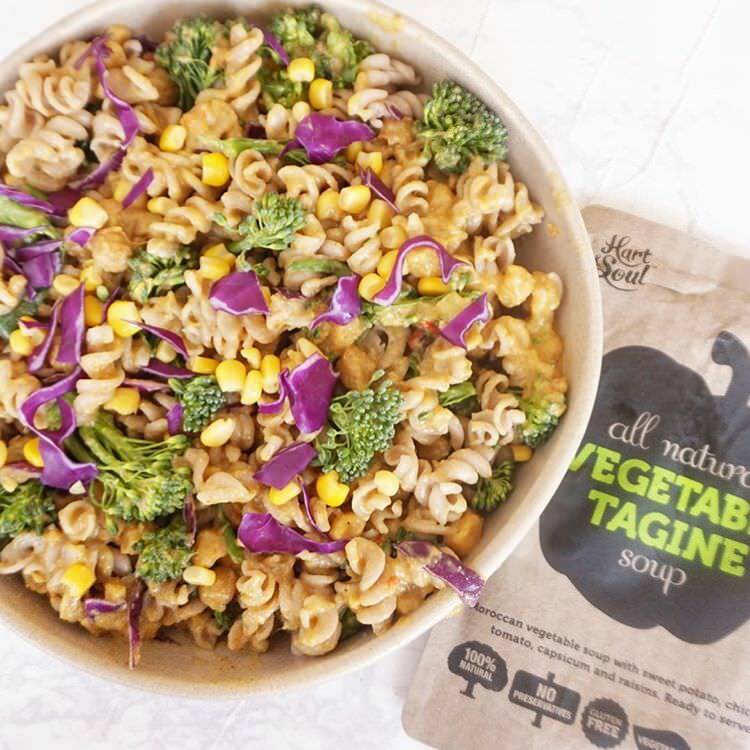 Elle from Cheeky Coconuts shared her delicious Baked Pasta recipe, featuring in our Vegetable Tagine Soup Pouch. A delightful infusion of Moroccan spices with sweet potato, chickpeas, tomato, capsicum & raisins making it a balanced meal. Sorry did we mention that this baby is Gluten Free and Dairy Free? Definitely a winner!